In the first part of this two-part post, I described the beginning of my journey to a new career in terms of three stages: initial wayfinding, orientation in the business world, and finally, further explorations to try to find my place within it. This post addresses those further explorations. As in the earlier post, my intention here is not to present a “how-to guide” for a process I’ve yet to complete, but rather to fill in a few gaps in my own story and to share some approaches and resources that could be helpful to others making a similar transition. I landed in programming after re-connecting to realms of art, science, and mathematics that I had mostly neglected in recent years due to the demands of professional specialization. I had spent at least five years delving deeper and deeper into specific realms of human experience and historical knowledge, and now, for the first time in a long time, I had the mental space to venture beneath the surface of new areas of knowledge. The experience was, and continues to be, one of both exhilarating discovery and an almost overwhelming, ever-deeper awareness of the extent of my own ignorance. For me, this process of discovery has been both spiritual and scientific, personal and professional. In this post, I want to address the more professional side of things. I’ve spent the most time studying within the fields of design, systems and network theory, mathematics, and, of course, programming. In many ways, there were easy natural bridges from my interests and work as a humanist to these other areas. Having studied premodern image theories and practices, and having worked with patterns of information access and organization through medieval manuscripts, I was quickly drawn to modern design as a language for information organization and communication. Having closely considered a variety of human systems, networks, and institutions in my work as a historian, I was especially interested to learn more about the interdisciplinary fields of systems, networks, and complexity. I was initially drawn to programming for many of the reasons I’ve previously described, and that interest, combined with the mathematical models I encountered in my reading in the natural and social sciences, incited me towards a renewed study of mathematics, which I plan to describe in a future post. In the context of these and other studies, I also devoted time to thinking about thinking itself, and the techniques, patterns, and concepts that I apply in reasoning. I’ve deliberately sought to expand my conceptual vocabulary and abstract and clarify the processes that I use, in order to make them more easily and immediately transferable to other contexts. The many times that I have already been able to reapply elements from my earlier liberal arts education leads me to trust that this renewed expansion will pay future dividends, even if it has come at the immediate cost of some time and resources that I could have focused on more specific new skills. Ultimately, this process of exploration and reflection led me to seek to develop new specific skills in programming. I’ve described this larger process here for two main reasons. First, I wanted to offer something to other current or former students and teachers in the humanities interested in making a career change. I wouldn’t consider this post a blueprint, but I hope it might serve as encouragement or a source of ideas for other transitions. Second, I wanted to further communicate something of the complexity of my own journey towards programming. I don’t want to give the impression that this was obvious or hasty, or that I simply fell into it. On the contrary, it has been quite a deliberative process, and the deliberation and exploration are part of my story. The following is a short selection of some recommended resources drawn from my explorations. I provide ISBNs rather than full citation info to conserve space. Hack Design: Design lessons for programmer, curated by top designers, http://hackdesign.org/. Rebecca Hagen and Kim Golombisky, White Space is Not Your Enemy, 2nd ed., ISBN: 978-0240824147. William Lidwell, Kritina Holden, and Jill Butler, Universal Principles of Design, Revised and Updated, ISBN: 978-1592535873. Ellen Lupton and Jennifer Cole Phillips, Graphic Design: The New Basics, ISBN: 978-1568987705. Ellen Lupton, Thinking with Type, 2nd revised and expanded edition: A Critical Guide for Designers, Writers, Editors, & Students, ISBN: 978-1568989693. Donald A. Norman, The Design of Everyday Things, ISBN: 978-0465067107. Albert-László Barabási, Linked: The New Science of Networks, ISBN: 978-0452284395. Donella H. Meadows, Thinking in Systems: A Primer, ISBN: 978-1603580557. Melanie Mitchell, Compexity: A Guided Tour, ISBN: 978-0199798100. Edward B. Burger and Michael Starbird, The 5 Elements of Effective Thinking, ISBN: 978-0691156668. John Mason, with Leone Burton and Kaye Stacey, Thinking Mathematically, Revised Edition (1985), ISBN: 0201102382. 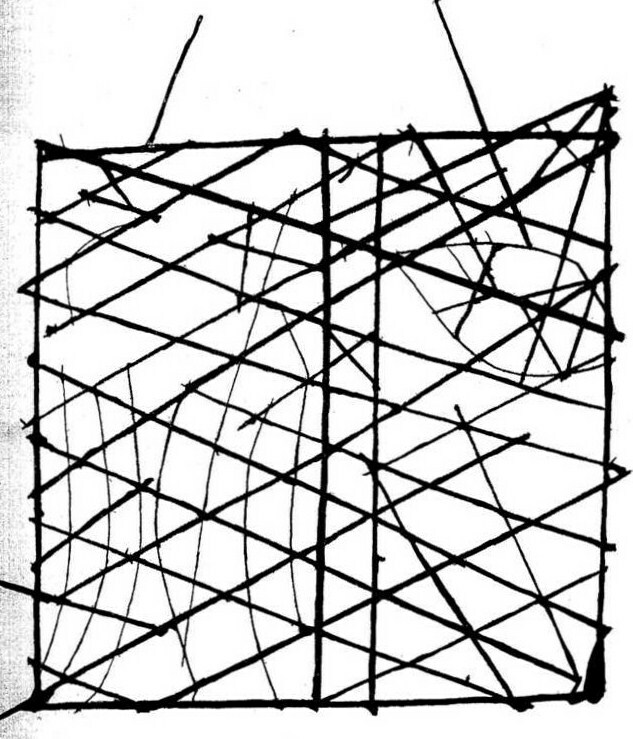 Photo of a Polynesian navigation device showing directions of winds, waves and islands. Credit: S. Percy Smith (http://www.nzetc.org) [Public domain], via Wikimedia Commons. In my first few posts, I focused on the tasks of introducing myself and my career change in progress. Last time, I wrote about why I’ve chosen to learn software development in particular, and I’ll be writing much more about the specifics of that process in the near future, but before I do, I want to pause to fill in a few gaps. The move towards programming was itself an outcome of a prior process of wayfinding that has a place on this blog as an earlier part of my journey. Since I hope the blog will act in part as a resource for others considering or making a similar career transition, it seems inappropriate to elide either my earlier career explorations or foundations in programming in order to slide ahead to my current projects. While I won’t presume to present a “how-to guide” for a process I’ve yet to complete, I would like to share part of my own story and some resources that I’ve found particularly useful in the hopes that they might prove helpful to others. In this two-part post on “Beginning the Journey,” I want to return to the earliest parts of my re-focusing and re-training. In hindsight, I can abstract the start of my own emigration from academe into three key stages. First, I acquired information about the journey and its possibilities. Next, I learned more about the landscapes and cultures of the business world I hope to join. Finally, I began to find a place for myself within it. This post addresses the first two stages. The next post treats the third. I knew that I was serious about leaving academe and finding a new career well before I had a clear idea of how I would do that. At the very beginning, it was critical for me to gain a working understanding of the overall shape of the journey ahead. I did this primarily in private and through books. The idealized career trajectory from graduate student to professor can be so clear as to be overdetermined, even if the actual process itself is rarely smooth or direct. For me–and, I imagine, many others in a similar position–the comparative openness and multiplicity of paths to employment outside higher education was initially quite disorienting. Traveling these alternative paths can feel more like informal, adaptive wayfinding rather than the precise navigation to which many in academe are accustomed. Luckily, although these paths cross over relatively uncharted territory, they are far from untraveled or unmarked, and helpful navigational tools are available. At this stage, I found two guides to be particularly useful. Both “So What Are You Going to Do with That?”: Finding Careers Outside Academia, by Susan Basella and Maggie Debelius (ISBN: 978-0226038827) and Life After Grad School: Getting From A to B, by Jerald M. Jellison (ISBN: 978-0199734306) lay out a general map and strategies for the type of career change I am attempting. I highly recommend both books to anyone considering a similar transition. The importance of a basic outline map can hardly be overstated. Having these maps helped me to confirm that I wanted to commit to this journey and to know where to start. Once I had a sense of the journey to be undertaken, I needed to learn more about the landscape and people of the business world in order to start imagining what my place could be within it. I did this through personal conversations and business books, periodicals, and websites. For me–and again, I imagine for many others in similar positions–this step was easier than the first, if only because of the relatively greater accessibility and openness of others with immediately relevant personal experience. The personal and professional difficulty of speaking openly with current and former academic coworkers about the process of pursuing an alternative career can be quite considerable, and even prohibitively intimidating. In the very early stages of the process, it was, quite frankly, far more comfortable for me to seek guidance in books and online than in person. In contrast, once I moved on to exploring the business world, I quickly found that I already knew family members, friends, and acquaintances quite familiar with this world and quite happy to assist with career information and advice, just as the “maps” I recommend frequently reminded me. In short, I talked to the people I already knew, and asked new kinds of questions when I met others. This was tremendously helpful in pointing me towards possibilities for a new career. In terms of reading material, I found Josh’s Kaufman’s Personal MBA book and website to be especially helpful as an overview of fundamental concepts and practices in modern business. I have also benefited from following up on his introduction by reading several of his book recommendations on topics that particularly interested me. In addition, I simply started reading more websites and periodicals addressing different sectors of the economy. The main objective for me at this stage was simply to learn about the possibilities with an open mind and identify areas for closer exploration. For me, these further explorations eventually led to settling around programming and software development. If you find yourself in a similar situation and take a similar path, you might end up somewhere quite different. I actually see that as a strength of this approach. In my opinion, the important thing is to know that a career change is possible, and there are resources to help. My intention here is simply to help point the way. 1. To anticipate a possible objection, I am using “wayfinding” in this post in a more general sense, rather than according to its stricter definition in environmental design. And yes, I first noticed the illustration for this piece on Wikipedia in the process of searching “wayfinding” to confirm my recollection of the concept. 2. Which is not to say that it shouldn’t be done. On the contrary, I think these are vitally important discussions to have when you feel ready, and I am unequivocally glad that I did. 3. Josh Kaufman, The Personal MBA: Master the Art of Business (ISBN: 978-1591845577), and online at http://personalmba.com/. 4. Kaufman’s online list of recommendations and reviews is located at http://personalmba.com/best-business-books/.